The economic mood in Russia is tepid, but it has rebounded since 2015’s downturn, which was caused in part by Western sanctions and dramatically low oil prices. Today, Russians are divided, with 46% saying Russia’s economic situation is good and 49% saying it is bad. Highly educated Russians are a bit more positive about the economy (49%) than those with less education (39%). Russians are also increasingly optimistic about the country’s economic future, even though a plurality still views the future with trepidation. Today, 43% think the economic situation will improve in the next year, a share similar to 2015’s 38% but significantly higher than during the global economic crisis that began in 2007. Younger Russians are more optimistic about the country’s economy than the older cohort: 48% of 18- to 29-year-olds think the economy will improve in the next 12 months, whereas only 37% of those 50 years and older feel the same. Many signs indicate that Russia is at last emerging from the recession it entered in 2014. 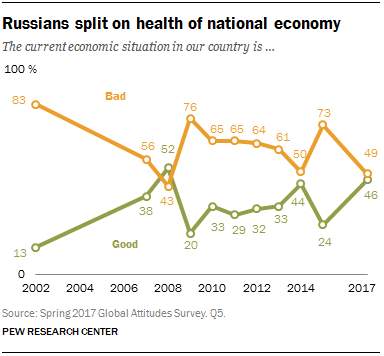 This is being felt personally by many Russians, with around half (51%) say their own economic situation is good, up 7 percentage points since 2013. Again, younger Russians are more positive about their personal situation than older Russians, with 59% of those ages 18 to 29 rating their economic situation as good, compared with 46% among those 50 and older. A large share of Russians continue to believe that Western sanctions have affected Russia’s economy. Today, 43% believe the sanctions have had a major impact, compared with 45% in 2015. Russians are as satisfied with their country’s overall direction as they have been since Pew Research Center began polling Russia in 2002. A majority (58%) of Russians are satisfied with the way things are going in their country, while 37% report being dissatisfied. Today’s rosy outlook mirrors the mood in April 2014, immediately after Russia’s takeover of parts of Ukraine. Younger Russians tend to be more upbeat about the way things are going than older Russians, with 67% of 18- to 29-year-olds expressing satisfaction and only 51% of those 50 and older saying the same. Those making more than the median income (28,000 rubles per month) also tend to be more satisfied (63%) than those making less (52%). Despite general optimism about their country’s direction, many Russians believe their nation faces some major challenges. Asked about nine issues, rising prices is most often cited as a “very big problem” (71%). Corrupt political leaders is the second-most-pressing concern, with 58% citing this as a very big problem, followed by lack of employment opportunities (54%), terrorism1 (54%), the gap between the rich and the poor (53%), crime (52%) and corrupt businesspeople (50%). Less than half see conflict between ethnic and nationality groups and immigration as very big problems (both 34%). When compared with their younger counterparts, Russians ages 50 and older tend to be more concerned about crime, corrupt political leaders and businesspeople, the wealth gap and rising prices. Women and men tend to view problems similarly, though women are significantly more concerned about terrorism than men (60% very big problem among women, 46% among men).